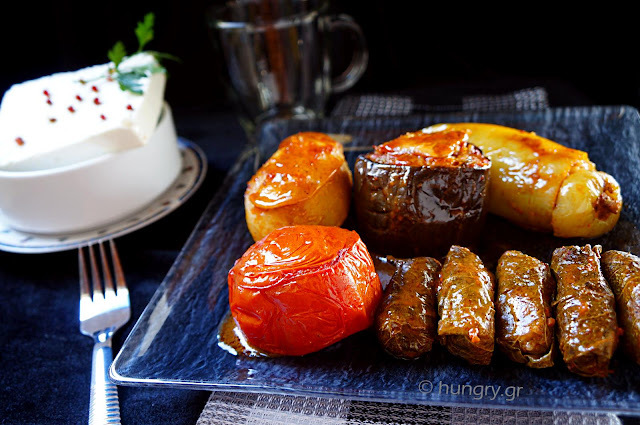 Greek summer is combined with lots of fresh aromatic vegetables as a main dish, salad or appetizer at our table, but also filled in various ways. It is the time when we find them abundant and in their best time! But it is also inconvenient to turn on our home oven at high temperatures. 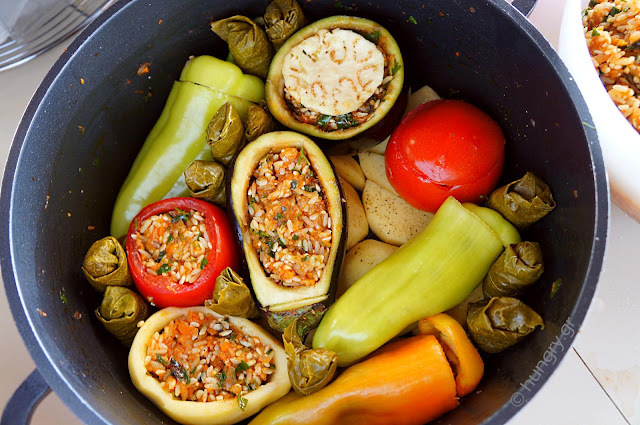 That's why today I propose to make stuffed vegetables in the pot. Like they make and make by housewifes due to missing oven or for faster and more economic process. They are done in half time from the oven stuffed vegetables. 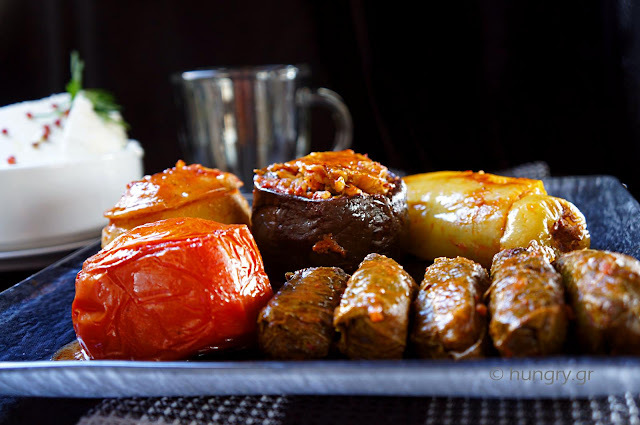 A variety of favorite vegetables, stuffed with rice and the crumb inside the casserole flavored with onions, mint and parsley. It is our One-Pot Meal. Everything in one! Wash the vegetables and cut a cap from each one, and empty the interior with a spoon. Peel the onions and garlic and mash in a blender and set aside. Mash the carrots also. From the peppers cut the top toward the stem and remove the seeds. 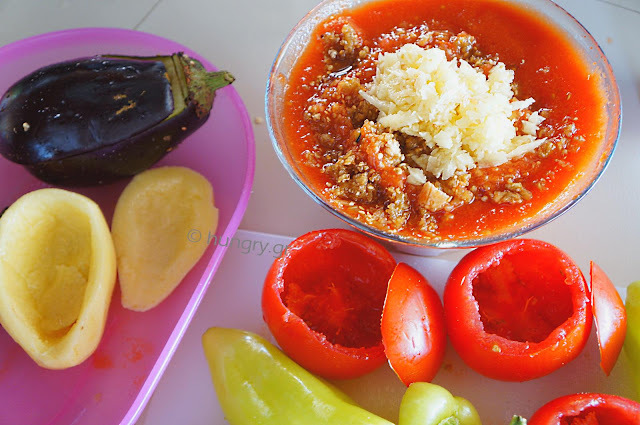 Mash the interior of the tomato in a food processor and gather in a large bowl. 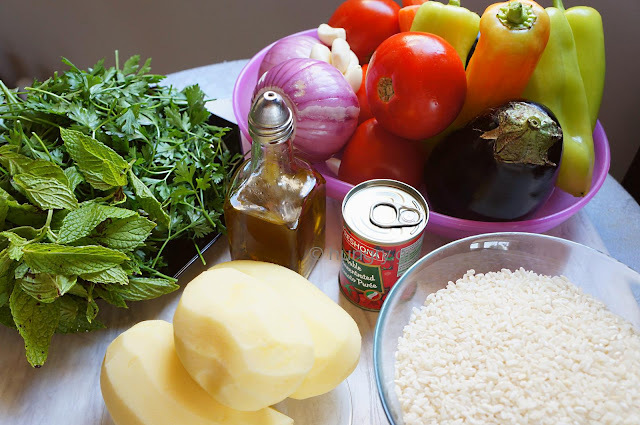 Do the same with the crumb of eggplant and potatoes, do not throw them away. They give taste to the filling. Salt inside all vegetables. 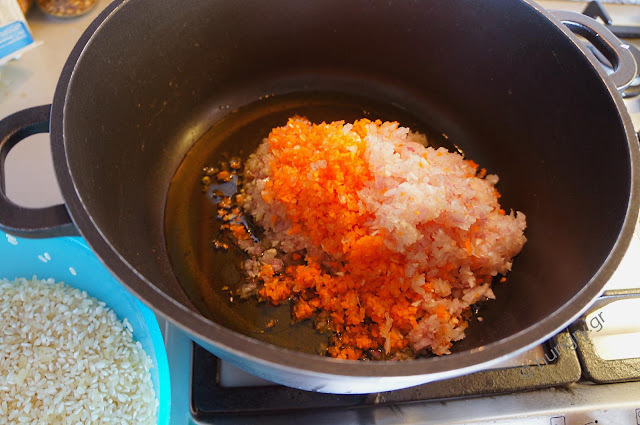 In large saucepan, in the same that you will cook the stuffed vegetables, put half the oil, pureed onions, garlic and carrots. Saute briefly to polish. Simultaneously wash the rice and drain. … and bring to boil. 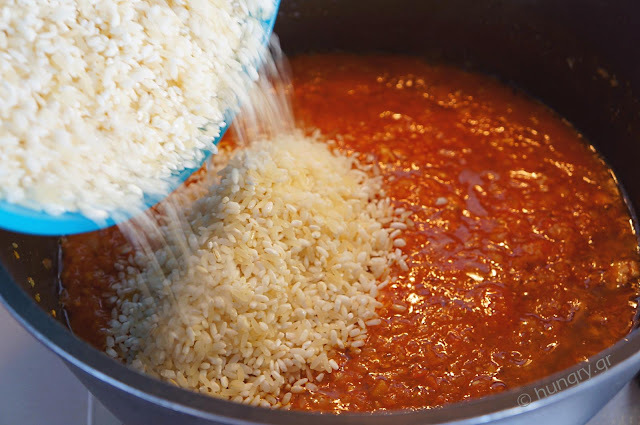 When the first boiling craters appear add the rice. Once it starts to boil again withdraw the saucepan from the heat and add the herbs, salt and pepper. Mix well and let the filling aside to cool for a while. Empty the contents of the pan into a large bowl. You will use the pot to put the stuffed vegetables. 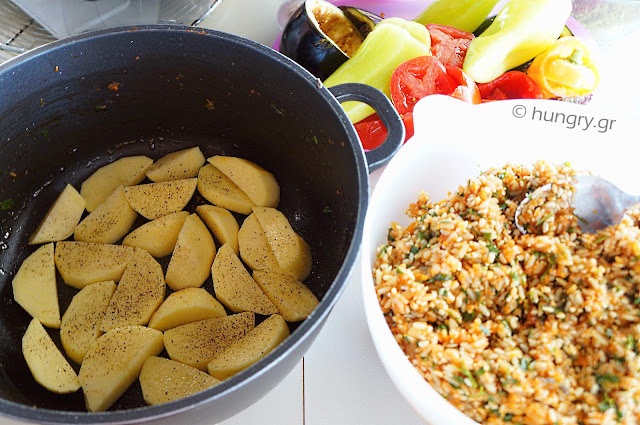 Cut a potato into slices and lay at the base of the pan, add salt and pepper. Above you place one by one the vegetables that you will fill. 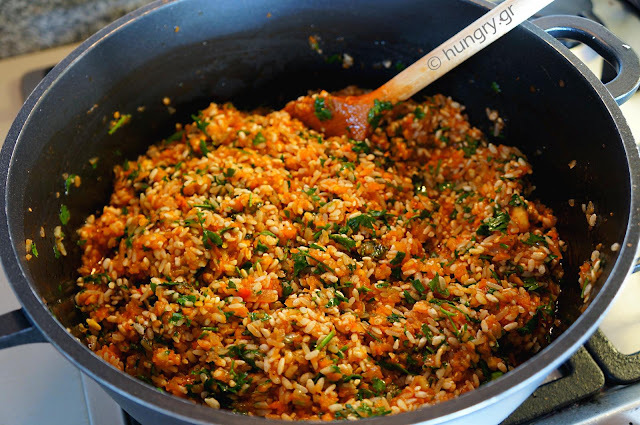 You get the empty vegetables and fill them with the stuffing mixture of rice, you have prepared. Place them over the layer of potatoes next to one another and cover with their caps. In between spaces fill with wrapped vine leaves or fill with courgette flowers if you have. Continue the second layer until it fills the pot. 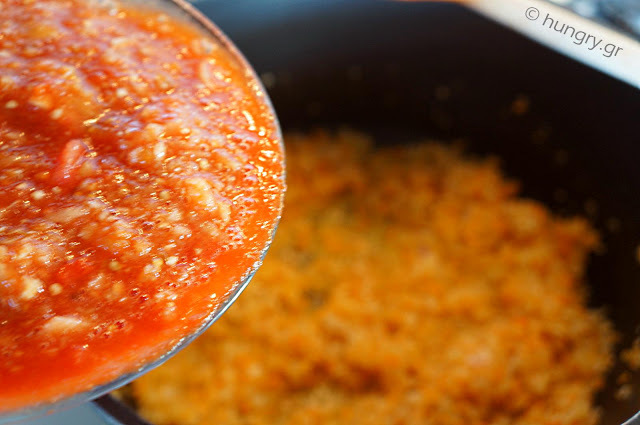 When the pot is full salt and pepper the stuffed vegetables, sprinkle with the remaining olive oil and the remaining tomato paste dissolved. Add water to just below the level of vegetables. If needed later add a little more hot water. Cover with a plate and the lid. 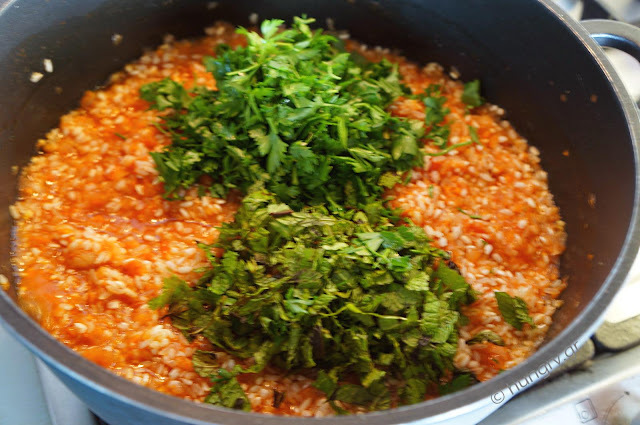 Cook over medium heat for one hour or until vegetables are tender and cooked rice. The selection of vegetables, which you will use, is the one you like the most. Add those which you and your family prefer. 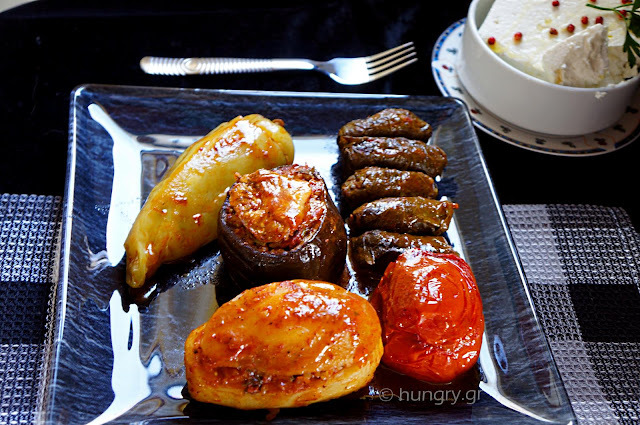 Stuffed traditional Lenten vine leaves, classical and favorites. Fresh leaves of the spring, almost the first, who make the Greek vineyards of the unique variety of sultanas. These can be found everywhere and are worth a try. 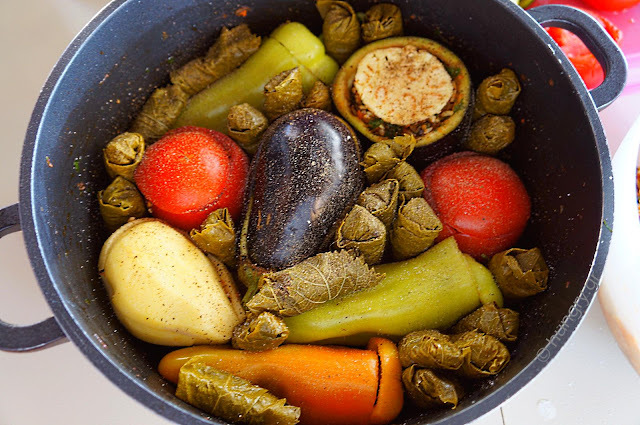 Small, green leaves, soft and thin as tissue paper to make delicious stuffed vine leaves. 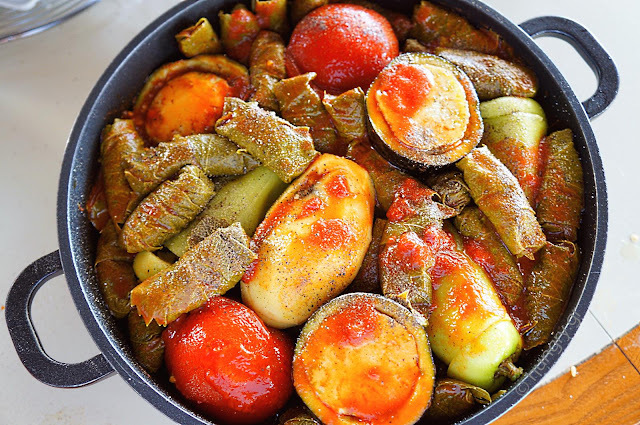 The only secret I have for the stuffed vine leaves to be yummy is to gently wrap with care… and much onion. Fresh and dry onion, herbs such as dill, mint (or parsley), salt and pepper. Put soft music and arm yourself with a smile, the end will justify your efforts. The detailed step-by- step recipe is dedicated to those new to cooking want to learn to make, rather than buy ready-made, canned, with contents of questionable taste. Dish colored with colorful peppers stuffed with a mixture of different, spicy cheese and bacon. Dish with dual option. That of an appetizer and this of main course. 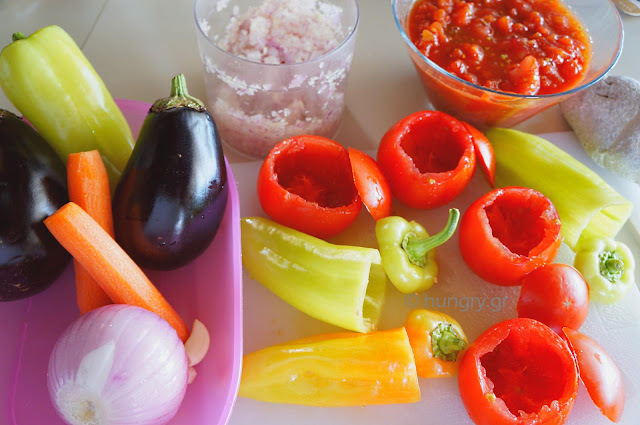 The peppers are an easy and delicious vegetable, which lends itself to be used in many tasty choices in the events of our kitchen. The ease in filling them (with a variety of fillings) makes them attractive to our liking. 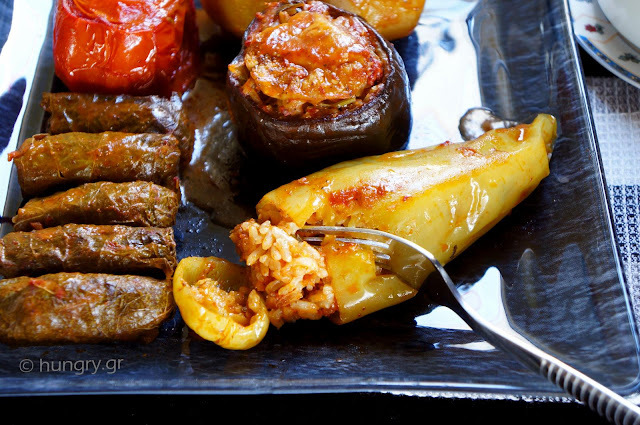 The favourite summer food, for most of us, is baked stuffed vegetables. Tomatoes, peppers, eggplants, and zucchini, filled with rice and herbs. 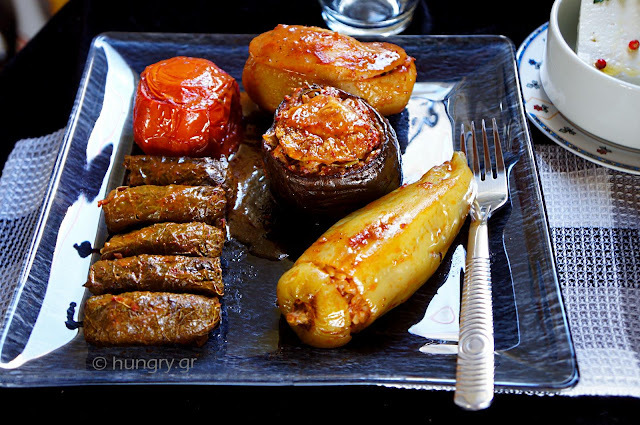 Plain, simple, without meat, with a concentrated flavor of all the vegetables and aromatic herbs used in the filling! For those who are fasting, for the summer fasting period, or for vegetarians this is a perfect choice.